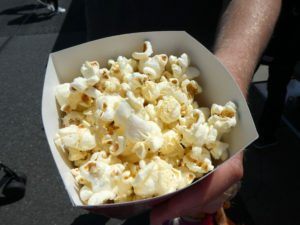 Flavored popcorn is all the rage in Tokyo Disney, and something that can’t be missed! From Curry to Chocolate, you can have it all, even mixed if you really wanted to take it to another level. 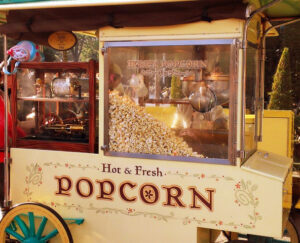 Disney offers 10 different flavors of popcorn in each of their Tokyo parks. Some of the flavors are shared between parks, but around every corner you’ll find a popcorn cart, and every guest carrying a bucket of popcorn in their hand or around their neck. Your daily map of the park will illustrate where each popcorn cart is located, and which flavor it will be featuring, and your family will love running all over the parks to try each and every one! 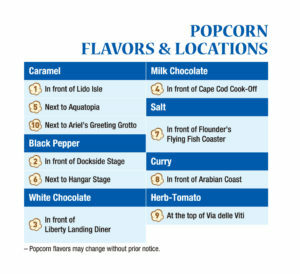 Popcorn flavors change seasonally, and new ones are added periodically. Some we’ve heard of, but weren’t available to try during our trip, include milk tea, strawberry, orange marmalade, corn potage, coconut, cappuccino, cream soda and jalapeno and cheese. As an aside, Japan is crazy about corn flavored things (we tried a corn flavored drink at karaoke). This was mine and Widmore’s favorite flavored popcorn flavor hands down! It tasted like hot chocolate melted with marshmallows. It wasn’t overly sweet, or coated, and was the perfect mix of chocolate to popcorn ratio. There wasn’t quite have enough flavor to it to recognize it was more than salt. On occasion you’d get a bite that would remind you it wasn’t just salt. This is your typical flavor enjoyed the world over. Classic. Gabriel who never wants anything more than plain cheesecake and plain chocolate chip cookies loved this one. Very similar to salt, and not at all spicy. Offered a slightly greater punch than salt. We really liked this flavor; but not enough to finish the box. It was mild, savory and salty. Pretty sure this was straight kettle corn, but Miss Pie thought it was the best! 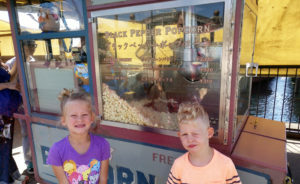 Every time she spotted a flavored popcorn stand, she ran up to check if it was caramel. This was our second favorite flavor, and as far as sweetness goes, we preferred it over caramel. It had just the right hint of honey, with a touch of vanilla. Our baby, Miss Eclair was a huge fan of this one. She also likes to eat honey straight out of the jar, just like Winnie the Pooh. Tastes like the popcorn was stirred in a bowl with a can of tomato paste. The smell was actually worse than the flavor, but the flavor was pretty bad too. Tastes like it’s tossed in heavy amounts of cumin with a touch of coriander and turmeric. Gabriel, who is a huge curry fan, couldn’t get past the overly heavy synthetic spice flavor. Reeked of stale tex mex mix spices. If you are a true die hand Disney fan, you can even purchase a souvenir popcorn bucket. They range from limited edition Mickey or Minnie, to every character Disney has ever introduced into our lives and vary between seasons, between parks, for holidays, or when they come back into style. 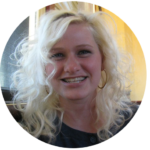 To purchase empty, they cost between $15USD – $50USD approximately. Most guests have at least one, but if you consider yourself a true Disney fan, you’ll commandeer these buckets like you would keychains. If you have 3 kids, you’re only going to have to spend $150 to get each child their favorite! Each tub of flavored popcorn will run you approximately $5USD, but if you have a popcorn bucket to refill, you could save yourself a dollar and some change each time. There is no limitation for how long you can reuse it for future visits. Disclaimer: We did not purchase a souvenir bucket. The $10 we would save did not woo us enough to spend an additional $5-$40USD per kid, though I wouldn’t have hated a BB8 one. Our children were fine without the special bucket, they were more interested in trying all the flavors then getting a cute bucket to put the flavored popcorn in. Every flavored popcorn stand will offer one to three styles of buckets. Your daily map will not have this information available, as it varies. If you are specific about the bucket you want to have, as you should be, head to Mediterranean Harbor at Valentina Sweets, Bon Voyage, or World Confectionery Store. There is no guarantee you’ll be able to find a large selection, if at all, but you might just get lucky. ► For Kids: Yes! They’ll love trying all the new flavors and sharing their opinion of how it tastes. 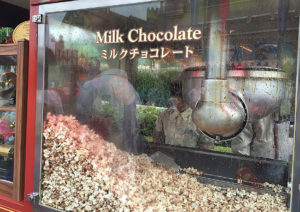 What was your favorite flavored popcorn at Tokyo Disney? Or which flavor would you want to try most? 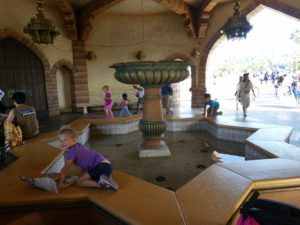 Check out our review of Tokyo Disneyland, and our ranking of every Disney park across the globe.